LAFAYETTE, Ind. 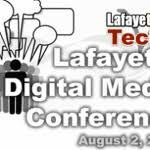 — Few seats remain for the first Lafayette Digital Media Conference to be held on Tuesday, August 2 at University Plaza in West Lafayette. The panel for the LDMC reads like a who’s-who in local technology. Nine professionals from diverse industries will join community members for an afternoon of networking and conversations on digital media trends. The focus of the Digital Media Conference is on the growth and subsequent localization of social media and how this impacts small and medium-sized businesses. Discussions will cover web-based tools like Facebook, Twitter, LinkedIn, Yelp, Foursquare, etc. as well as digital devices and smartphones that can be used to leverage communications, education and facilitate business. Conference participants will learn from experts about how this technology can enhance their bottom-line, and panelists will share how they have successfully integrated social media into their marketing and customer engagement. “I chose to participate in this event because I think it is important to share knowledge to help others do better and be better,” said Scott Wise. His own business has benefited because of the support and knowledge of others, he said. And, through this conference, he hopes to continue the “pay-it-forward” trend. Patrick Nycz said his clients frequently ask questions about social media. At the conference, he hopes to share the questions a company or brand should be asking as they consider moving toward a social media engagement.